CLAUDE LANGEVIN (1942 - ) When Claude Langevin explained to me the way to his home, Reggiani’s words came to mind: “you continue straight ahead/ up to a golden river/ Which is named la Loire/ sand-colored eyes/ you take it by the left side/ then a right, and then strait ahead/ and when you’re there/ When you’re there/ Just ask for the house/ everyone knows us/You can’t go wrong.” The river does not bear the same name it is called Noire like the lake. I therefore met a man who wants, as a singer would, he wishes to express himself by his paintings and proclaim his affection for his land and his people. We can feel the long since unfailing connection between Claude Langevin and Saint-Jean-de-Matha. 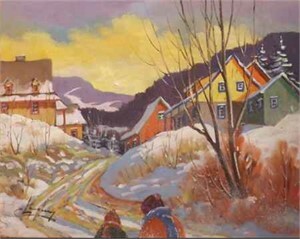 Yet this artist has traveled a great deal throughout this planet, having lived elsewhere in a quest for places to paint, the roads always lead him back to his native land. A true nature lover, he is inspired when he returns to his roots. Sketchpad in hand, he explores the regions’ every nook and cranny. 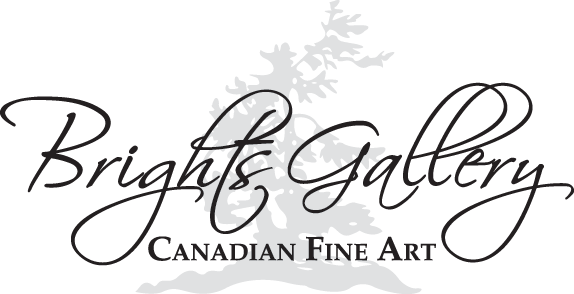 Following in the footsteps of admired artists such as Tom Thompson or Clarence Gagnon, he loves to work outside, spontaneously reproducing scenes of nature and his native land. Before attaining today’s tranquil serenity and pinnacle career, the road ahead was not always easy. Nevertheless, his persistence, effort and will to succeed will overcome many pitfalls. From the outset, the era is against him. Born in 1942, he is from a generation where becoming a painter is not very well seen, especially when coming from a doctors family. Not being one to duck out of it, he goes so far as undertaking medical school. He recounts that he sometimes used his talents to good account by sketching his companion’s biology home works. But he was hardly happy. He withdraws from his studies and works for a cousin producing low cost decorative paintings for furniture merchants. Having learned the hard way, he has retained a rapid execution to this day, very useful when outside in cold weather, where he must quickly seize the essential elements of a landscape. 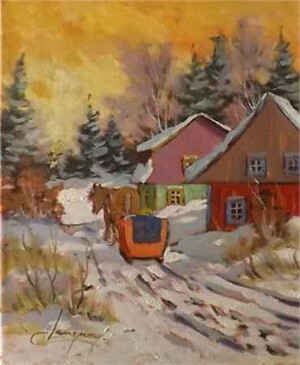 During the 1970’s, he begins to paint his own paintings. Working by day and creating by night, it was not rare to have 16 or 18-hour days. Considering himself a hard worker, he is not deterred; he even goes as far as opening art galleries in shopping malls. He quickly notices he cannot paint and run a business at the same time. He sells his galleries to his departed friend Denis Beauchamp. 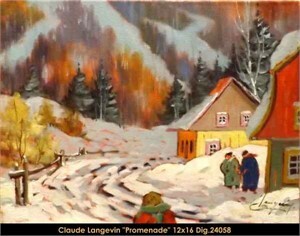 The latter having founded Multi Art, the agency that Claude Langevin is amongst the first to entrust the sale of his paintings. His experiments having brought him the use of many techniques, nevertheless he has long since returned to brush applied oil colors. He is essentially dedicated to landscapes fearing not being able to render as well as he would with other subjects. Stating: “We can’t be good at everything”. I doubt his words of course; I’m sure he would do just as well in portraits or still life. From what I can gather, Claude Langevin can hardly see himself as a recluse still life painter. He needs air and space. Consequently, it does not surprise me to hear him say: “ One must go outside. Nature does not deceive. Nothing clashes in nature, no matter what the season. Colors, tints, nuances, the whole palette is used. Painting on the spot is still the most faithful way to judge the beauty which surrounds us”. 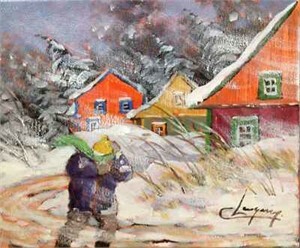 His proximity to water, the presence of his cats and above all his faithful old friends in his dear village, all contribute to the tranquility and peace of mind in Claude Langevin’s paintings. Michel Beauchamp, October 2004 “An artist begins to form his own style when he stops imitating nature and starts interpreting it. 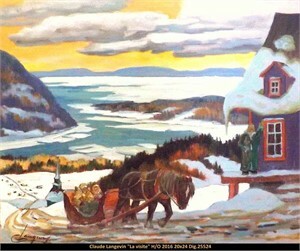 At this stage, the distinctive features that identify individual painters are visible in each canvas.” Claude Langevin has been painting for over 30 years. 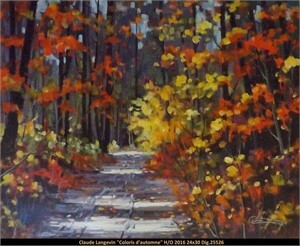 A self-taught artist to whom painting is second nature, he continues to derive great pleasure from his art. He often finds inspiration riding the bicycle path along the route of the old Laurentian railway to Sainte-Adele, his adopted town where he settled 27 years ago. In recent years due to urban sprawl, his surroundings have changed dramatically forcing this landscape artist even deeper into the country in search of inspiration. “When you live in a region for a long time, familiarity diminishes its beauty. CLAUDE LANGEVIN (1942 - ) When Claude Langevin explained to me the way to his home, Reggiani’s words came to mind: “you continue straight ahead/ up to a golden river/ Which is named la Loire/ sand-colored eyes/ you take it by the left side/ then a right, and then strait ahead/ and when you’re there/ When you’re there/ Just ask for the house/ everyone knows us/You can’t go wrong.” The river does not bear the same name it is called Noire like the lake. I therefore met a man who wants, as a singer would, he wishes to express himself by his paintings and proclaim his affection for his land and his people. We can feel the long since unfailing connection between Claude Langevin and Saint-Jean-de-Matha. Yet this artist has traveled a great deal throughout this planet, having lived elsewhere in a quest for places to paint, the roads always lead him back to his native land. A true nature lover, he is inspired when he returns to his roots. Sketchpad in hand, he explores the regions’ every nook and cranny. 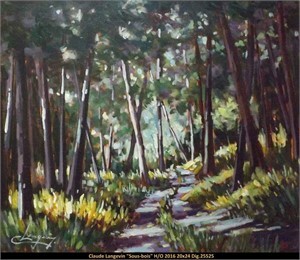 Following in the footsteps of admired artists such as Tom Thompson or Clarence Gagnon, he loves to work outside, spontaneously reproducing scenes of nature and his native land. Before attaining today’s tranquil serenity and pinnacle career, the road ahead was not always easy. Nevertheless, his persistence, effort and will to succeed will overcome many pitfalls. From the outset, the era is against him. 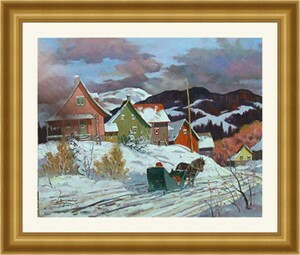 Born in 1942, he is from a generation where becoming a painter is not very well seen, especially when coming from a doctors family. Not being one to duck out of it, he goes so far as undertaking medical school. He recounts that he sometimes used his talents to good account by sketching his companion’s biology home works. But he was hardly happy. He withdraws from his studies and works for a cousin producing low cost decorative paintings for furniture merchants. Having learned the hard way, he has retained a rapid execution to this day, very useful when outside in cold weather, where he must quickly seize the essential elements of a landscape. 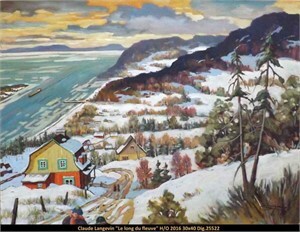 During the 1970’s, he begins to paint his own paintings. Working by day and creating by night, it was not rare to have 16 or 18-hour days. Considering himself a hard worker, he is not deterred; he even goes as far as opening art galleries in shopping malls. He quickly notices he cannot paint and run a business at the same time. He sells his galleries to his departed friend Denis Beauchamp. 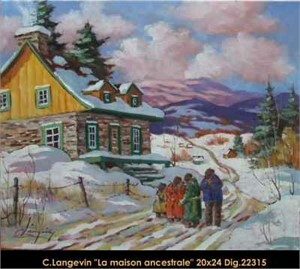 The latter having founded Multi Art, the agency that Claude Langevin is amongst the first to entrust the sale of his paintings. His experiments having brought him the use of many techniques, nevertheless he has long since returned to brush applied oil colors. He is essentially dedicated to landscapes fearing not being able to render as well as he would with other subjects. Stating: “We can’t be good at everything”. I doubt his words of course; I’m sure he would do just as well in portraits or still life. From what I can gather, Claude Langevin can hardly see himself as a recluse still life painter. He needs air and space. Consequently, it does not surprise me to hear him say: “ One must go outside. Nature does not deceive. Nothing clashes in nature, no matter what the season. Colors, tints, nuances, the whole palette is used. Painting on the spot is still the most faithful way to judge the beauty which surrounds us”. His powers at their peak, Claude Langevin is self confident and content of the course he has taken. His experience permits him to say: “With time, we learn to interpret what we see, to refine it and preserve what we like most in the structure as well as in the colors. We learn to make the most of this magic moment when everything comes together to make a good painting. To wait or to come back later will not give the same result.” His proximity to water, the presence of his cats and above all his faithful old friends in his dear village, all contribute to the tranquility and peace of mind in Claude Langevin’s paintings. 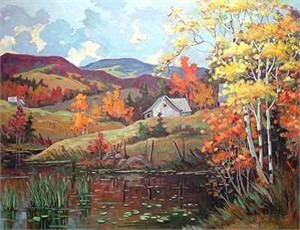 Michel Beauchamp, October 2004 “An artist begins to form his own style when he stops imitating nature and starts interpreting it. 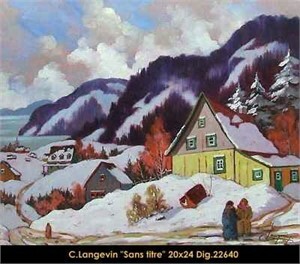 At this stage, the distinctive features that identify individual painters are visible in each canvas.” Claude Langevin has been painting for over 30 years. 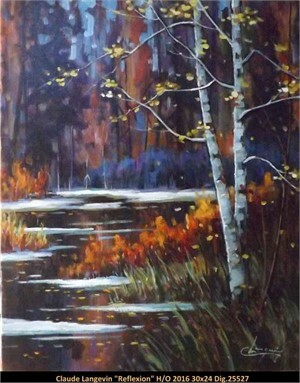 A self-taught artist to whom painting is second nature, he continues to derive great pleasure from his art. He often finds inspiration riding the bicycle path along the route of the old Laurentian railway to Sainte-Adele, his adopted town where he settled 27 years ago. In recent years due to urban sprawl, his surroundings have changed dramatically forcing this landscape artist even deeper into the country in search of inspiration. “When you live in a region for a long time, familiarity diminishes its beauty.